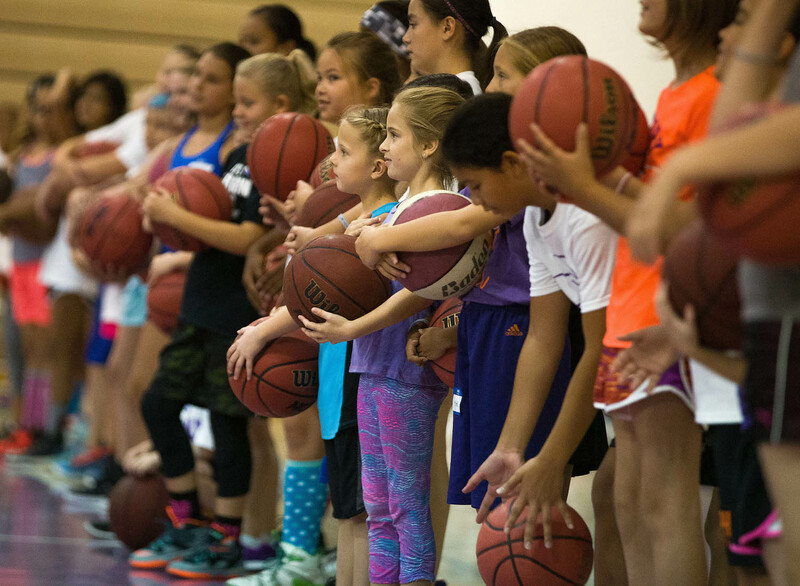 Move over boys — basketball is for girls, too. 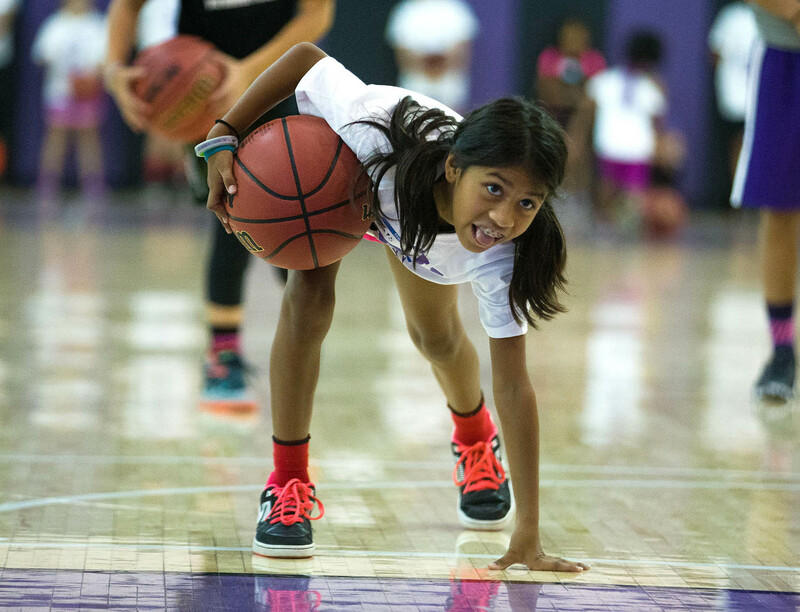 That’s the motivation Grand Canyon University’s women’s basketball team members touted as they welcomed about 50 future stars to Antelope Gym on Monday for the first of a two-day program. 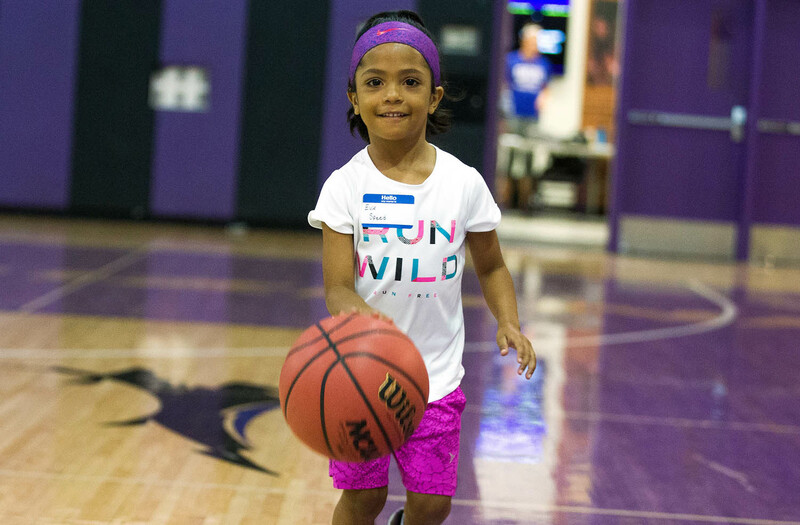 This camper is all smiles at the GCU Lil Lopes basketball camp. 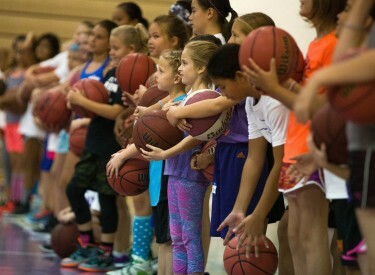 In their long shorts, ponytails and neon-colored sweatbands, the girls in the Lil Lopes Skills Camp giggled, dribbled and hopped. But when GCU assistant women’s coach Krystal Thomas strode to center court and blew her whistle twice, the campers instantly froze, slapped the floor and shouted, “Defense!” She blew her whistle once more and the girls rushed to form multiple line combinations across the floor. Campers take on a spirited training of running, dribbling, agility work and other drills. Thomas, a former Phoenix Mercury player, said the ultimate goal of the camp is to point younger girls to the game of basketball by focusing on form, shooting, passing, dribbling, agility and defense. So how easy was it to keep the group of 7- to 12-year-old girls engaged? Zelor Massaquoi, who joined Rarrick in coaching the camp this year, said the best part was seeing the mix of personalities and getting as much out of it as the campers. “Sometimes when you’re a college basketball athlete, every day is about hard work and training to get better, but you look at these girls and they are a reminder of how much fun basketball is, so I feel very appreciative that they look up to us,” Massaquoi said. For Massaquoi, the best part was when she missed a half-court shot and one of the girls ran up to her to console her. Randal and Sheri Williams drove to GCU from Yuma to watch their granddaughter, Lexi Stuebs, and the other players. They enjoyed the interactions from the sidelines. Randal, a former high school basketball player himself and a coach at a recreation center in Yuma, said he was beyond impressed with the coaches. He said he hopes their oldest granddaughter will attend GCU in the future. But for now, he will focus on encouraging his granddaughters to come back to GCU for more basketball. “We love everything we’ve seen,” Randal said.